What's the Matter with Arizona??? 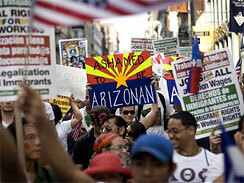 In April, Arizona Governor Jan Brewer signed into law the anti-immigrant legislation, SB 1070. The law mandates state and local law enforcement to stop and check the immigration statuses of anyone they believe could be an undocumented immigrant. If a "suspect" can't prove legal status on the spot, he or she may be detained. And, built into the law is the right of legal Arizona residents to sue state officials or agencies that fail to or choose not to enforce SB 1070 (see Sec. 2, Article 8G). You might be wondering, How can they tell if someone is undocumented? Simply put, they eyeball it. If you're a individual with brown complexion, you're fair game. If your next thought is, Isn't that racial profiling?, you're right on track. Despite Gov. Brewer's defense of the law and assurances that racial profiling will not be a practice in its enforcement, it's clear that it was happening even before the law was passed, as in this case of wrongful detainment. What's still very unclear is how racial profiling won't be a practice in its enforcement. That being the case, we can safely say that the law is immoral, unconstitutional in the U.S, and in violation of international human rights standards. There is a growing movement of cities, coalitions, organizations, and individuals--some very high profile--who have furiously protested Arizona's action since the law passed in April, an indication of its gaining momentum. But, this is no light debate. President Obama has taken a very public stand against SB 1070. And, while he earlier pledged to pass immigration reform this year, he more recently worked a vague pushing of that deadline into a Cinco de Mayo address. If this movement for humane immigration reform maintains its intensity, a historic immigrant rights victory just may be on the horizon.